Subsequent NASA research in Hawaii by Shepherd and Hubbard in 1989 showed that modern upwind-bladed wind turbines could also generate higher than expected infrasound and low frequency noise, especially when the inflow air was turbulent. 10 This occurs when wind developers site wind turbines too close together. More recent work by Laratro et al 11 has confirmed that tip vortices have only just broken down at 7 rotor diameters (using free stream speed of 10m/s), providing empirical support for a minimum of 7 rotor diameter separation distance. 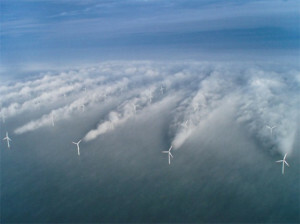 The following photo shows the wake turbulence generated by wind turbines, from a maritime wind development in the Atlantic called Horns Rev. 13 The turbulence extends to a significant distance many kilometres away, and increases significantly when subsequent turbines are downwind and receive the turbulent inflow of air. These are the precise conditions which Shepherd and Hubbard 14 demonstrated in 1989 markedly increase the generation of ILFN from upwind-bladed wind turbines. Acousticians as a profession are far more knowledgeable about the range of symptoms and sensations directly caused by exposure to infrasound, low frequency noise, audible noise, and vibration than most health professionals, with the exception of some occupational physicians 15,16 and some ear nose and throat specialists. 17,18,19,20 These symptoms are commonly called “annoyance”. The only explanation for these flawed studies/reports/position statements is that the issuers/authors wished to promote and protect the wind industry, at the expense of the health of the rural neighbours to these wind projects. These rural residents are sometimes openly referred to as “collateral damage” or “policy roadkill” by wind developers and some of the public servants who promote the business interests of the wind industry. Professor Chapman has been invoking the “nocebo” hypothesis for some time prior to conducting his own research, 42, 43 but more recently he has cited new research from New Zealand by PhD candidate, Fiona Crichton 44 to support his frequent assertions that scaremongering is itself causing the symptoms. In contrast, rural residents are exposed to wind turbine noise day and night when the wind is blowing, for up to 25 years, and are reporting their sleep is regularly and repeatedly disturbed in addition to a range of other effects which directly correlate with exposure to operating wind turbines. Rural residents are often not young, and may have chronic pre-existing physical and mental illnesses, which make them more vulnerable to the adverse consequences of chronic sleep disturbance and stress. Inconveniently for Crichton and Chapman, whilst there is no doubt that a nocebo effect exists in the general research literature, there is no such evidence of a “nocebo effect” collected directly from wind turbine affected residents in the peer reviewed research, nor is it consistent with the clinical, acoustic and psychoacoustic findings of health practitioners and researchers from the UK, 47 Australia,48 Scandinavia,49 the United States,50 Canada,51 & New Zealand. 52 Interestingly, the “nocebo effect” is never used by Chapman with respect to identical symptoms occurring in residents exposed to and affected by ILFN from coal mining or gas fired power stations. “… suggesting a diagnosis of ‘nocebo’ without investigating, ‘boots on the ground’, for more plausible, better understood, or more logical causes of a medical condition would normally constitute medical malpractice in most Western-based medical systems, including Australia. Individuals who are not physicians are not limited by this professional mandate or even necessarily this conceptual framework. Those who are young and fit report taking longer to be adversely impacted by exposure to wind turbine noise, unless they have underlying physical and mental health conditions or acknowledged risk factors such as a history of migraines, inner ear pathology or motion sickness, which make them more vulnerable or susceptible. There are many clinical clues and some animal and human research which strongly suggest that disturbance of the vestibular sensory system, and the consequent sleep disturbance and physiological stress are integrally related and that the direct causal link is sound and vibration energy, whether it is frequencies above 200 Hz, or frequencies in the infrasound or low frequency noise spectra below 200 Hz. This research, 60,61,62,63 together with the clinical and research evidence of Vibro Acoustic Disease 64.65 resulting from chronic exposure to infrasound and low frequency noise, can no longer be ignored. It is long overdue for all acousticians to act according to their professional codes of ethics 66, 67 and to put the interests of the health and safety of the community first, and to work collegiately with health professionals who are trained in accurate diagnosis of specific clinical conditions. To date, acousticians working as paid consultants with the noise polluting industries have unfortunately all too often chosen to ignore the reported adverse impacts and “shoot the messengers” namely the concerned health practitioners, fellow acousticians or other researchers. That approach will not solve the current problems with respect to wind turbine siting and noise pollution regulation, or the serious damage to health being caused by other sources of infrasound and low frequency noise. The Kelley research from nearly 30 years ago established a baseline of operating parameters to help prevent annoyance and consequent deterioration in health from chronic exposure to infrasound and low frequency noise,68 yet these parameters have never been implemented. The ethical responsibilities of these members of the various acoustical societies who have assisted with writing the noise guidelines for government are clear – it is a primary responsibility of acousticians to protect the health of the public. 69 The ethical responsibilities of the medical profession similarly would appear to have been neglected in the case of wind turbine noise. The health of rural residents has clearly not been protected, and nor has this been the priority of public officials, both elected and public servants who are responsible for public health, noise pollution regulation, planning or siting of wind turbines. Australia ratified the treaty of the Convention of the Rights of the Child in December 1990, which the UN adopted in 1989, and therefore Australian governments have a responsibility to ensure that all children in Australia have the rights set out in the Convention. 74 In Australia some children and their families have been unable to continue to live in their homes because of serious adverse health impacts, which have affected children’s health, and affected their schooling. Others report their children’s sleep and health is regularly adversely affected. The lack of effective action at all levels of government in Australia to prevent the ongoing irreparable harm to physical and psychological health to Australian rural residents is unacceptable, and must be urgently addressed. There is no reason that similar injunctions to prevent wind turbines from operating overnight could not be immediately imposed and enforced at those wind developments where noise nuisance and adverse health effects are occurring. Daytime exposure limits to infrasound and low frequency noise according to the Kelley 1985 criteria could be immediately implemented. 78 Turbine separation distances could and should be immediately mandated at a minimum of 7 rotor diameters, in order to prevent future avoidable planning disasters. The harm to human health is serious, and preventable. We know enough now, to act immediately, to prevent further irreparable and serious harm to physical and psychological health at existing wind developments. Posted on: 2 June 2014 . Category: Acoustics, Definitive Documents, Health, Human Rights, Nocebo Effect, Waubra Foundation Documents. Tags: Adverse Health Effects, Annoyance, Definitive Documents, Headaches, Infrasound, Low Frequency Noise, Nocebo, Sleep Deprivation, Wind Turbine Noise.